The U.S. Constitution requires an accurate count of the nation’s population every 10 years, which is critical to establishing equal government representation and identifying where to allocate federal spending and resources for millions of children and families in our society. Ensuring a fair, equitable and successful implementation of the decennial census has far-reaching outcomes for the protection of civil rights and our nation’s economic future. This not only includes securing adequate funding for the census, but also reversing the recent decision from the U.S. Department of Commerce to reinstate a citizenship question on the 2020 questionnaire. If this question remains, it would have severe implications for the reliability of the 2020 data, resulting in significantly lower response rates among immigrant and mixed status families. The 2020 decennial census is coming up quickly yet remains underfunded. While the recent FY18 federal spending bill (H.R. 1625) appropriated $2.814 billion for the Census Bureau, approximately $1.13 billon more than the administration’s adjusted FY 2018 budget request, ($1.68 billion), it is noteworthy that the report accompanying H.R. 1625 includes language to allow the use of half of the appropriated fiscal year 2018 dollars in future fiscal years 2019 and 2020. This “forward funding” is justified because nearly 70% of the lifecycle costs of the 2020 Census will be incurred in fiscal years 2019 and 2020. The report further explains that making current resources available in those later fiscal years will help to ensure a smoother transition between fiscal years 2018 and 2019. As Congress turns its efforts toward the FY 2019 budget, those of us advocating for a successful decennial census need to keep a watchful eye on the allocation of FY 2018 funding in order to ensure critical preparation activities are not shortchanged. Insufficient census funding is particularly problematic for young children, who continue to be undercounted in the census. Young children (under age five), are the most likely to be undercounted, and more than one million young children were missed in the 2010 decennial census. And this problem is only continuing to grow. The count of young kids is becoming less accurate at the same time that the count of adults and older kids continues to improve. While it is not completely understood as to why young children are so severely undercounted, we do know children of color are more likely to be overlooked. We also know that 1.3 million children and youth experience homelessness each year, with many more living in unstable housing situations. These children are living in highly mobile households that are likely to be missed entirely by the census. Young children in households that are splitting time between parents, living with grandparents, or residing in multigenerational households are also often not fully accounted for. Early investments in a child are crucial to place them on the right track to healthy development and success. Child development research shows that kids benefit from resources provided at an early age – and that those resources create a long-term positive impact on every child’s life. Therefore, it is particularly critical we can account for all young children in our society and identify how to allocate resources that provide healthcare, nutrition, early childhood education, and affordable childcare assistance to help support healthy childhood development. For Hispanic children, the problem of being undercounted is exacerbated by a recent decision from the Department of Commerce to add a question on citizenship in the 2020 census. Coupling this announcement with aggressive and cruel immigration enforcement tactics currently being undertaken by the Trump administration, the expectation becomes a dramatically reduced participation rate from immigrant and mixed status families who fear the negative repercussions of revealing their immigration status. Title 13, section 141 (f)(2) of the U.S. Code establishes that the Bureau must deliver the 2020 census questions to Congress not later than two years before the appropriate census date, April 1, 2018. The announcement of the inclusion of a citizenship question, which has been absent from the census since 1950, comes days before that target date and therefore raises serious concerns. According to the Department of Commerce’s FY 2018 budget justification: “Any changes to the topics or questions after that point would have significant cost and schedule impacts on all English and Non-English questionnaires, the questionnaire vehicles (Internet, telephone, and paper), translation, and printing, and will put the 2020 Census at risk.” Announcing the reinstatement of the citizenship question only five days before the April 1 date technically meets the deadline, but it does not allay the undesirable and serious consequences that will result if this question is added. The inclusion of a citizenship question will lead to a lower response rate and unreliable data on immigrant and mixed status households. This has severe negative consequences for the protection of the civil rights of these families, resulting in unequal representation and misallocation of government resources in areas with high immigrant populations. Therefore, it is critical for the well-being of children in immigrant families that this decision from the Department of Commerce be overturned. In the upcoming decades, the ratio of seniors to those of working age will be twice as great as in the 20th century. This means far fewer workers to support our economy and replace the retiring workers. This shift would be even more dramatic if it wasn’t for immigration, for grown children from immigrant families will account for about ¾ of the working age growth projected from 2020 to 2030. Therefore, it is imperative that we prioritize investment in our nation’s children. Yet to understand the funds needed and how to properly allocate them, we need a reliable, accurate count that includes all of our country’s children. 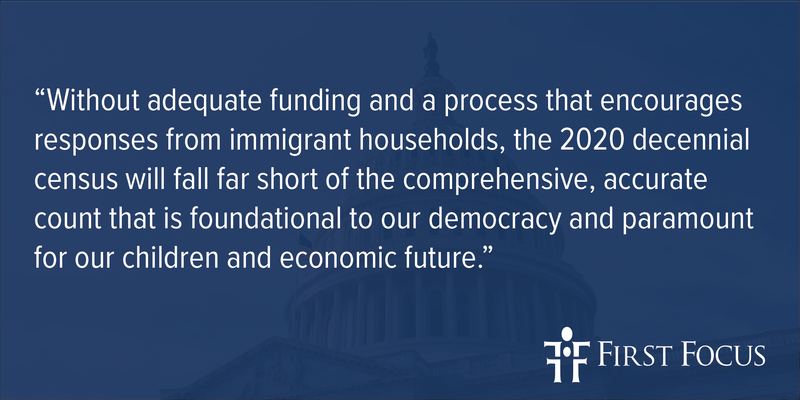 Without adequate funding and a process that encourages responses from immigrant households, the 2020 decennial census will fall far short of the comprehensive, accurate count that is foundational to our democracy and paramount for our children and economic future.